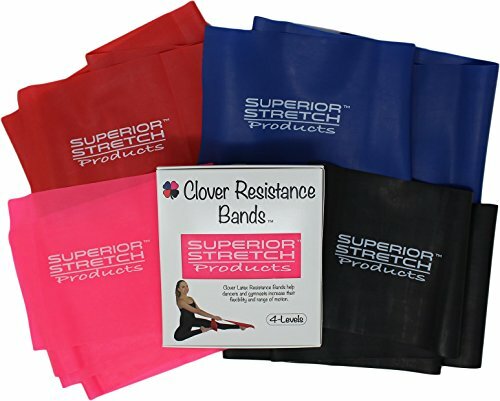 Clover Latex Resistance Bands help dancers and gymnasts increase their flexibility and range of motion - Included are 4 separate bands - color coded for 4 Levels of Progressive Resistance, Level 1 = Pink, Level 2 = Red, Level 3 = Blue and Level 4 = Black. Most therapy bands are only 4 inches wide. Clover Bands are 6 inches wide by 4 feet long - with not 3, but 4 individual progressive bands in each box, each made of top quality latex rubber. Light weight and portable, Clover Resistance Bands can be slipped into the pocket of any dance or gym bag and can be used during class, at the gym, at home or during rehabilitation. Attractive box set of 4 bands makes the perfect gift for your dancer or gymnast. Instructional information is available from Superior Stretch with link information included in the box set. If you have any questions about this product by Clover Resistance Bands, contact us by completing and submitting the form below. If you are looking for a specif part number, please include it with your message.